I Crave It, I Make It, I Eat It! This sweet treat is incredibly easy to make and utterly refreshing on a hot day. Only 4 ingredients and no machines needed for this recipe. Click here to PIN this Black Cherry Granita! This is a sponsored post written by me on behalf of Sparkling Ice. All opinions are 100% mine. 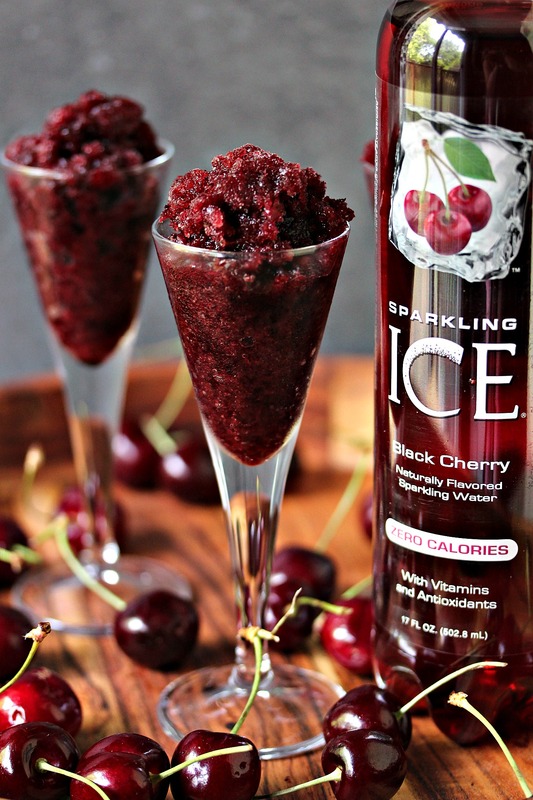 Are your ready to Flavor Up your summer with Sparkling Ice this summer? I’ve been mixing up fun concoctions with a variety of their tasty and bold water this summer. 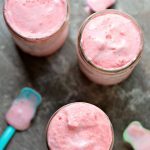 I made some Cherry Limeade Ice Cream Floats earlier this year. Then I whipped up some Boozy Strawberry Watermelon Slushies. It’s been an absolutely delicious summer thus far. For this post I went out on a limb, almost literally. We packed up some Sparkling Ice and headed to Point Pelee for a fun adventure. Nothing beats a day wandering around the wilderness. I knew we were going to be hot and worn out when the day was done. 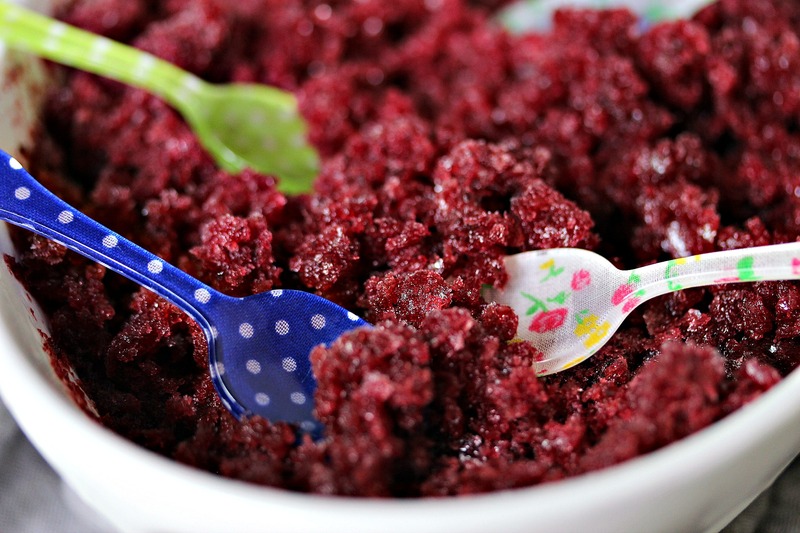 So before we left I whipped up an easy granita recipe. That way when we got home we would have a refreshing treat. 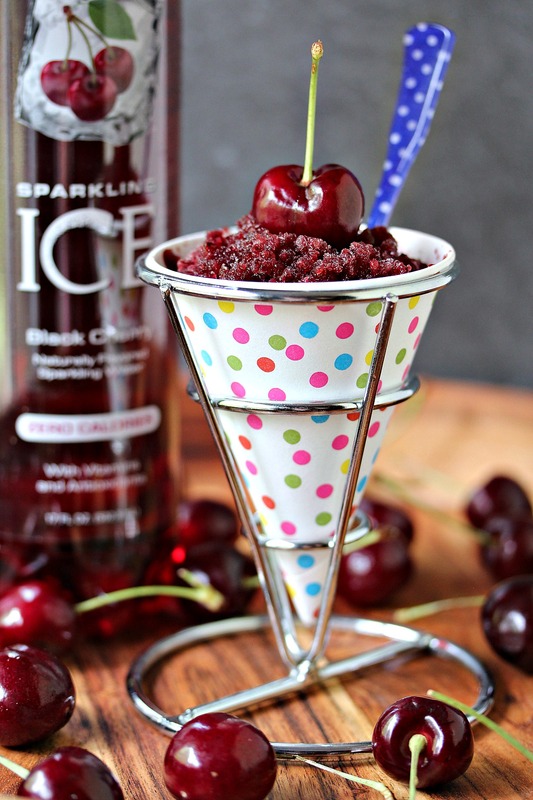 This Black Cherry Granita is perfect after a day of “fun in the sun”. We hiked, biked, and had a picnic at the park. I always pack up some sandwiches or taco salads for days at the park. Needless to say this went over well with everyone after our day trip. Nothing quenches your thirst quite like a cool treat. I love this one because it’s so easy to make. I’m so happy to have partnered with Sparkling Ice for this summer campaign. It’s been an absolute riot to be part of. I’ve had so much fun developing recipes for them. Sipping those recipes has been a huge perk of the job. Make sure you check out Sparkling Ice on social media. They have a reward program happening until July 31, 2016. You can save points to earn fun swag. Learn more HERE! Share how you make your summer better with Sparkling Ice®. You can share your #FlavorUp moments on Twitter and Instagram for an opportunity to be featured in their gallery! Be sure to tag @sparklingice and use the proper hashtag, which is #FlavorUp. 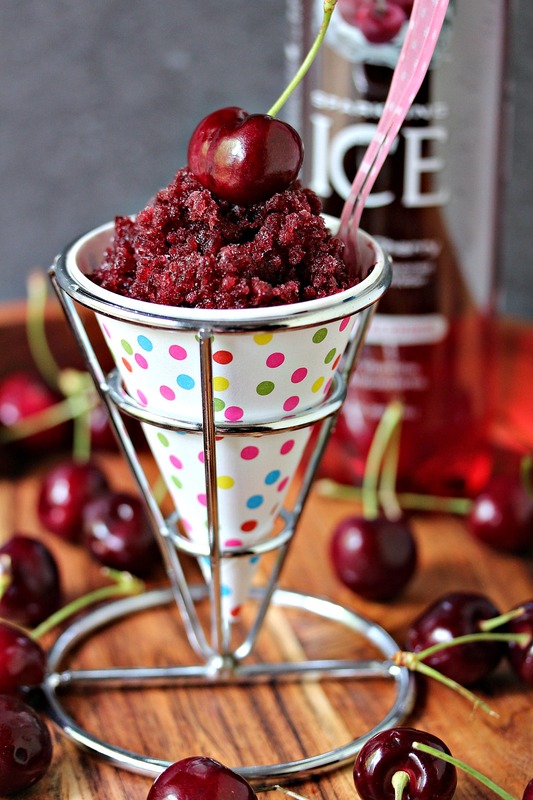 Now let’s make this Black Cherry Granita right this very minute! You’re going to flip your lid over this one! 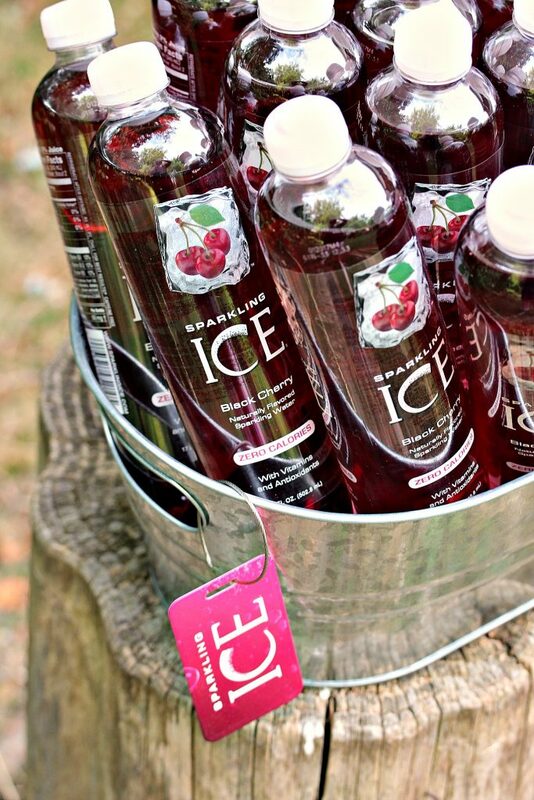 Flavor Up your summer with Sparkling Ice, just like I did! Places to stalk Cravings of a Lunatic! 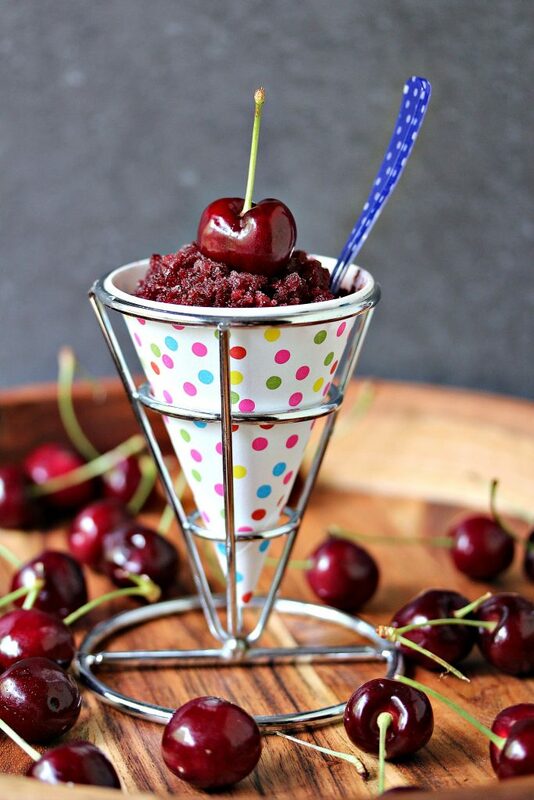 Place the cherries in a food processor, or blender. Pulse until the cherries become smooth liquid. 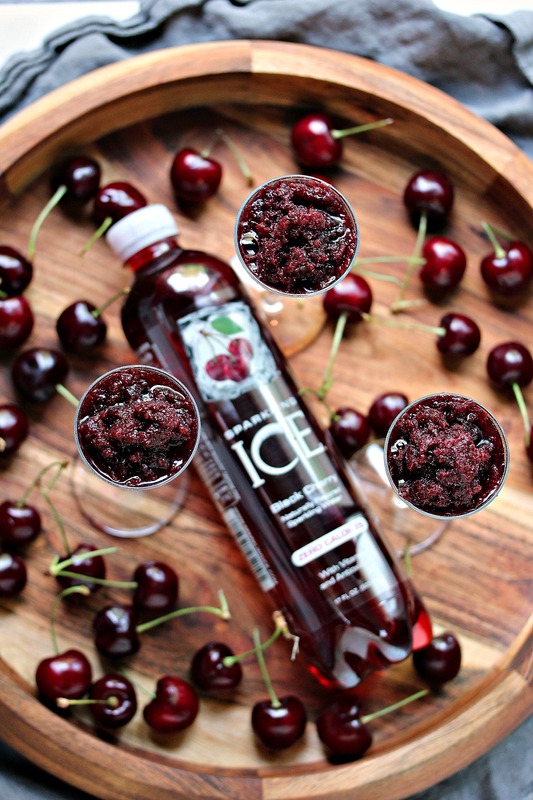 Pour in sugar, Black Cherry Sparkling Ice, and almond extract. Pulse until smooth. Pour into a metal loaf pan, or any bowl of equal size. Place in the freezer. 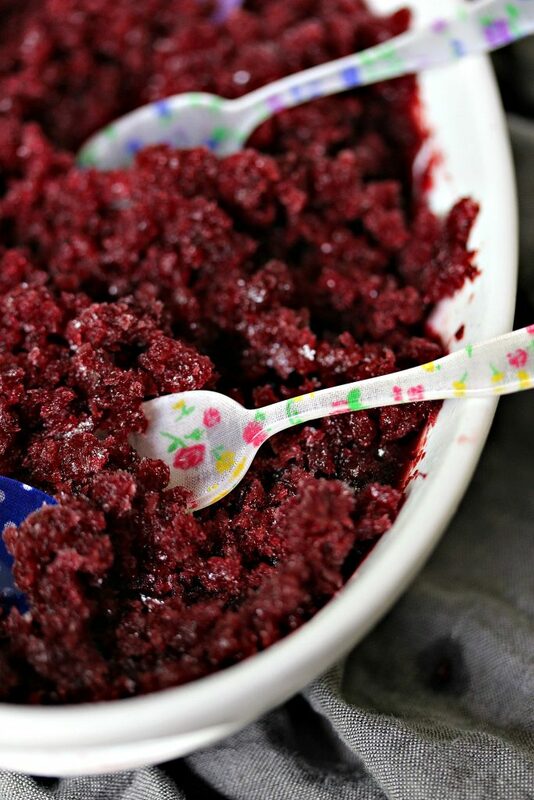 After about 4 hours give the granita a scrape with a fork. Repeat as desired. Freeze overnight. Remove and scrape the mixture with a spoon. Transfer scraped parts to serving dishes. 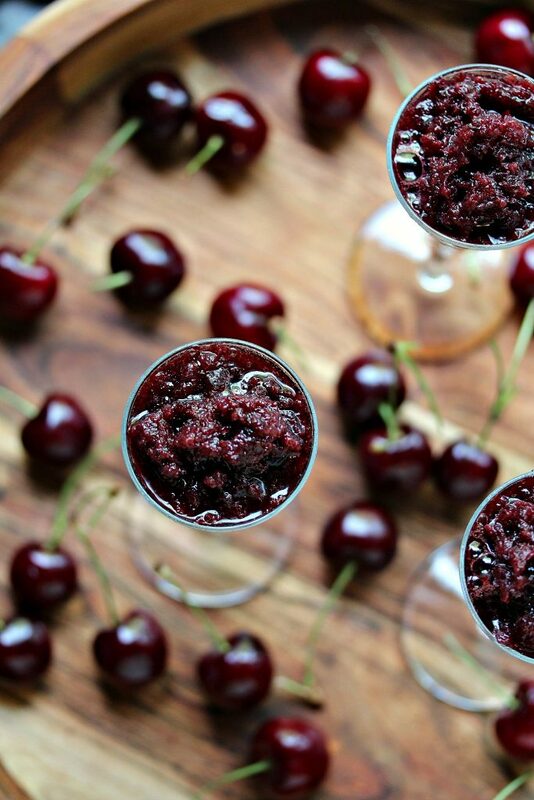 Serve with a big old Black Cherry loving smile! Pin this to your favourite summer board! 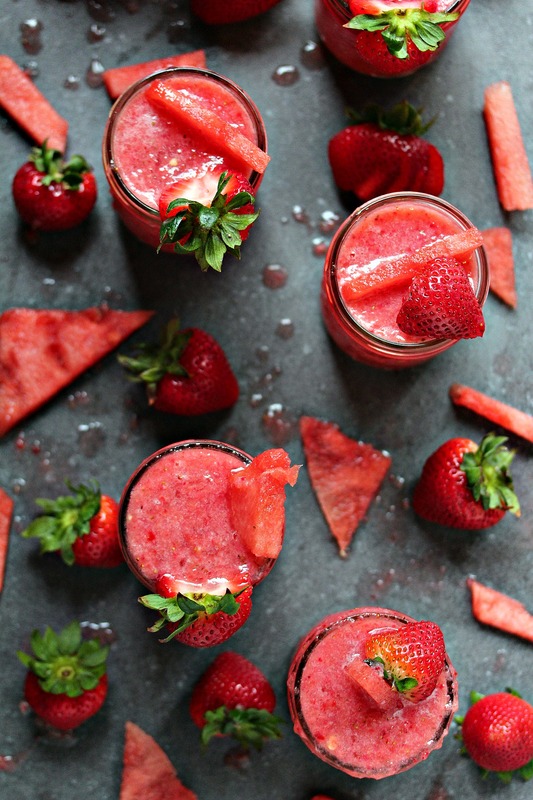 Crack open a bottle and whip up something refreshing this summer! 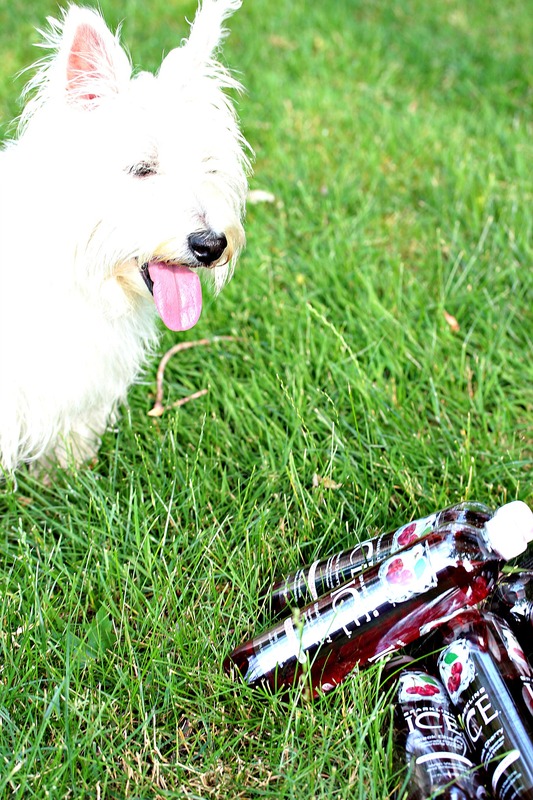 Remember to bring lots of Sparkling Ice for the humans at your next picnic, and lots of regular water for the pups! Sparkling Ice is not dog friendly, but the ice bucket was calling Malia’s name! Slurp! Be sure to check out my recipe index for more summer recipes. You will find lots of beverages, as well as frozen treats. Also take a minute to follow me on Pinterest and Instagram to stay up to date on all the latest recipes on the blog. 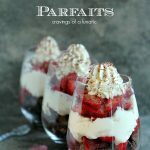 Subscribe for FREE recipes sent right to your inbox! Oh hello gorgeous!! 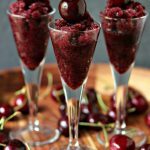 My husband will not crazy for these as he loves anything cherry! They look so refreshing. Thanks Ashley. This was so fun to shoot. I had an absolute blast the day I made these. Camera in one hand, and a giant spoon in the other so I could eat it in between takes. Ha. Such a delicious day. Hope your hubby loves this if you get a chance to try it. Kim, these are so gorgeous! 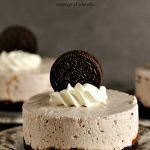 I love these and can’t wait to make these! Awe, thanks Lauren. I had a blast with this project. SO much fun. Hope you love them. I absolutely adore Sparkling Ice! 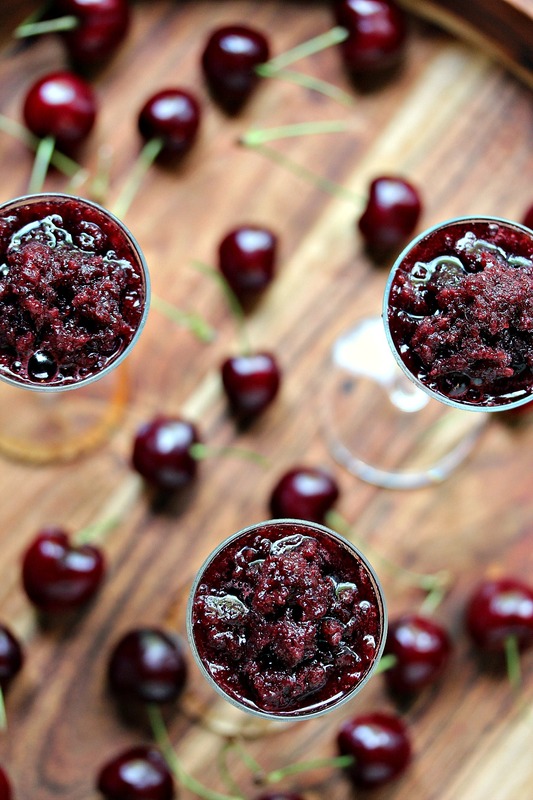 I also adore both cherries and granitas, so this recipe is perfect! Me too Kirsten. It’s so perfect. I wish I could develop recipes for them every single day because their product is so fun and interesting to work with. I’m having a blast. Plus this was SO delicious. Simply stunning! My son is always asking for this drink, so next time at the store I will say YES! 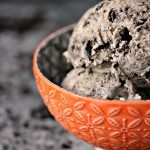 That looks so good and I LOVE it in the poka dot cone! haha Perfect for these hot summer days! These are beautiful shots and brilliant idea!What can I say, this so refreshingly creative! 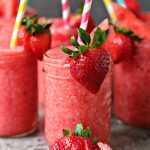 These look so refreshingly fabulous! Thanks Sara. Hope you love them. Ha, those spoons are a real treat. I got them years ago online. I can’t recall the name of the store. I’ll have to dig it up. Not sure if they sell them any more. But I’d love more myself so I’ll google them next week. This looks like a wonderful and refreshing summer dessert. Lovely photos too!! What a fun post! I love your little granita cone/cups – they look awesome. Sparkling Ice is a favorite at my house. You came up with such a creative way to use it besides drinking it! Sounds like a fun day and this is a beautiful looking refreshing treat! First, your photos are gorgeous! And that granita is just spectacular! Exactly what I need to be eating on a July afternoon in South Florida! I ’bout flipped my lid just looking at the photos! Absolutely gorgeous! Sounds like the perfect summer day! This granita is spectacular! This looks so refreshing and delicious! Your photos are always so gorgeous, and this is no exception. Gah! Good minds think alike because I have something similar coming up soon! 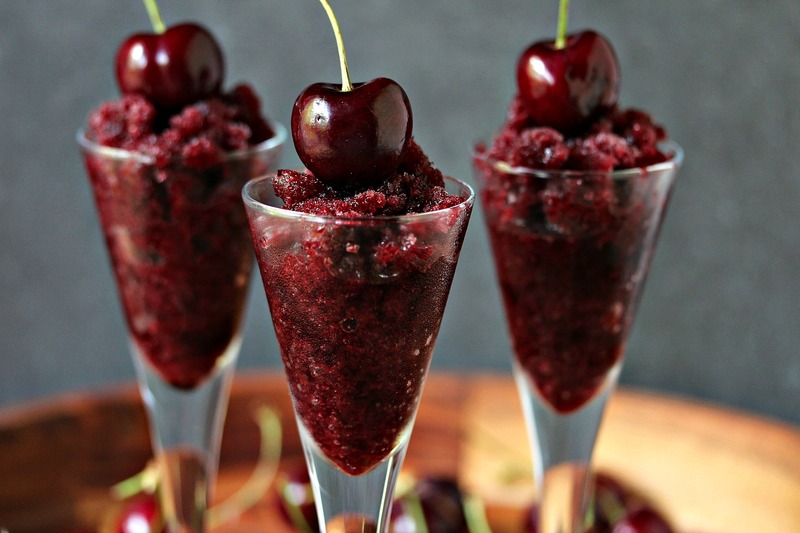 There is seriously nothing better than granita in the summer – especially black cherry! This looks like it would be so yummy on a summer day! Thanks for sharing at Welcome Home Wednesdays! Subscribe and Never Miss a Bite! Enter e-mail address for free updates!